Toyota has already proven that all vehicles coming from its factories deserve both attributes dependable and durable. 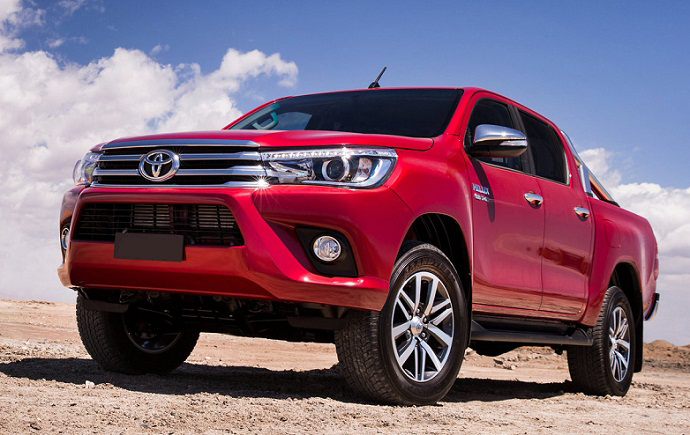 However, there is only one machine which has also earned the reputation of the “unbreakable” truck and that is, of course, Toyota’s Hilux pickup. However, a few days ago, Toyota released a teaser sketch previewing the new concept model which should be unveiled in next couple months. With the new concept model known as the Toyota Hilux Tonka concept, Toyota is bringing the truck version with the extreme style and capabilities. This model has been imagined by Toyota Australia’s in-house designers. It will present what you get when build the Hilux truck inspired by the Tonka toy. In that context, Mr. Nicolas Hogios, Toyota’s product design chief in Australia, commented that Hilux and Tonka brands were a natural fit. Thanks to that, this upcoming monster machine will be built to celebrate 80 years of Toyota Motors Corporation and the 70th anniversary of Tonka. And as the result, we will get a big toy for the big boys. Unfortunately, Toyota hasn’t said much except it shown a teaser sketch of the Toyota Hilux Tonka concept. However, even looking in this sketch we can conclude that Toyota’s new truck will look tough and capable while will also get a serious off-road hardware. Actually, this upcoming off-road monster and rock climber will be based on the Toyota Hilux SR5 4×4 Double Cab version. But, from the visual perspective, the designers will augment almost every exterior element of it. It will also add specific stickers and color combination. The model will get more aggressive grille and tailgate design. To its tough look, Toyota will also add massive bumpers and augmented wheel arches with extra-large wheels and all-terrain tires. From the profile side, we will see door moldings in black and yellow livery. There will be more specific components which have currently been undisclosed. The interior of the Tonka Concept is total mystery at this moment. However, considering that it will be based on the SR5 Double Cab version we expect similar cabin design and features like in this trim. Of course, there will be the unique upholstery and components specific to the Concept version. Being based on the Hilux SR5 4×4, the Toyota Hilux Tonka concept will likely get the power from the top-spec version of the 2.8-liter four-cylinder diesel engine. This powerplant can produce about 175 hp (130 KW) and torque of 420 Nm at just 1400 rpm. The four-wheel drive system and 6-speed transmission should also be employed. On the other hand, in order to attack all-terrains, the Hilux Tonka Concept will sit on the raised chassis. It will also get custom suspension plus the massive wheels with all-terrain tires and strong brakes. The Toyota Hilux Tonka concept will debut as the fully drivable concept in the next few months.